I’m not a huge Hallmark holidays person. This past New Year’s Eve I went to bed at 11:30, on the Fourth of July I think I stayed home and maybe watched a movie?, and this past Halloween I ate chips and dip and watched a football game. But when it comes to holidays that involve celebrating with gifts or other gestures of affection (Valentine’s Day, our anniversary, Jonathan’s birthday, Christmas) I lose control. I will pretty much take advantage of any opportunity to plan surprises. I LOVE surprises. And I am generally more excited about doing the surprising than the person on the receiving end is to get the surprise. Not always. But often. Frankly, it’s just hard to match the level of enthusiasm I reach when planning a surprise. Sometimes I don’t sleep at night. 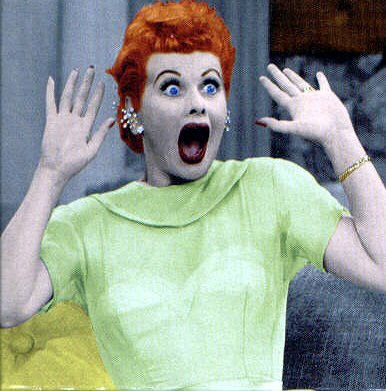 This is how I always imagine people will react to my surprises. 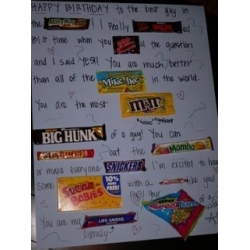 I once made Jonathan a giant poster with a bunch of different candies that stood for different words of the message. I don’t remember the whole thing, but it ended with “You may not have 100Grand, but you will always be my Sugar Daddy” and I had his roommate sneak this giant poster into his room so he would get it on Valentine’s Day. Mine was like this, except it said different things. Better things. And once I got up at like 4:30 in the morning and hid presents for him all over his house/in his bag/in his classes, etc. I even contacted his professors (some of whom I didn’t even know) and had them give him some of them. When we were apart one summer I made him cookies and overnight FedEx-ed them to him. And the summer I went to England I wrote him a card for every week I would be gone and left them for him to open one a week. I e-stalked and contacted a writer who lives across the country to get her to autograph a book for my sister’s birthday. Like I said, surprises are kind of my thing. This Valentine’s Day is a little different, though. This year I decided to relax a little. Decided that I didn’t have to have the number one best surprise ever up my sleeve. That maybe one or two little things were enough. So for once I haven’t spent hours thinking of a perfect gift or experience or way to show my love. And yet, today I managed to give a surprise that surprised even me. This morning I got dressed in what I thought was an appropriately festive Valentine’s Day outfit. Black and white patterned skirt, red top, black scarf, gorgeous, cherry red stilettos. I tried to do some black tights this morning, but couldn’t find them anywhere and so went without. No big deal because I have a desk job. At lunch time I had the brilliant idea to use the Bruegger’s gift card my company gave me for my birthday to get a cup of soup to bring back and eat at my desk. (There is a Bruegger’s right outside of my building.) So I go on my merry way in my cherry red heels and my bouncy little skirt. When I get outside I realize it is an exceptionally windy day that makes me feel like I’m back in Illinois. Luckily the Bruegger’s is just across the street. I go in, order my delicious chicken spaetzle soup to go and on impulse decide to get a drink too since my giftcard has enough for both. My soup goes into a container and then into a paper bag which I am holding with my right hand, trying to keep the bottom steady so that they soup does not tip over. In my left hand I am holding my tasty diet coke. My purse keeps sliding off my shoulder into the crook of my right arm, messing with the precarious balance of the soup inside the bag. I take a couple of steps and my drink (although it has a lid) manages to slosh out and a few drops fall onto my gorgeous cherry red suede shoes. Now I have to concentrate on keeping my soup stable and not spilling any more drink on my shoes. I push open the door and take a few steps when a huge gust of wind comes up and starts lifting my perky little skirt into the air. I bend forward expertly keeping a grip on both my soup and my drink and pressing my forearms against my thighs to keep my skirt down. As I lean forward, this gust of wind swoops around and blows up the back of my skirt exposing my black-lace-covered bottom to anyone who happens to be in the parking lot or looking out the window. Surprise, everybody! Big surprise! I am pretty sure this is EXACTLY what I looked like. But please excuse my slightly inappropriate picture. Here’s hoping you have a wonderful Valentine’s Day. That you are not subjected to any kind of indecent exposure. And that any surprises you give or receive are the good kind!